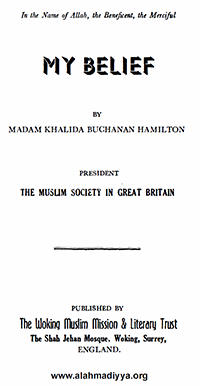 Khalida Buchanan Hamilton writes about her belief (Islam) and the superiority of her new belief over her old one (Christianity). I think the sublimest conception of life is the one in which we regard ourselves as the agents of a Perfect Being Who guides and controls our Destiny. It is absurd to think that we can chalk out and control the destiny of humanity when even the greatest of us cannot control his own impulses and does not know when he starts his life, how he is going to end it. If, instead of having this sense of Providence instilled into our minds, we were left to our own impulses, which are nothing but forces of arrogance and impetuosity, we should long have been extinct as social beings, attempting the perfection of ourselves—individually and collectively. As to the nature of this Providence to Whom we should apply in spirit for the guidance of our individual and collective destinies, there is a divergence of opinion. Per­sonally, I am inclined to think that the person of the Providence should be one and all-comprehensive—admitting of no division or decentralization. People in this country talk glibly about different things in Islam, but they seldom take the trouble to understand the spiritual meaning of the monotheism for which that religion stands. People would be well advised to recognize that all attempts to confuse the issue raised on this score by the Islamic faith inevitably lead to the disintegration of the socio-spiritual life of humanity. Now, if the Will at the source is decidedly One, and possesses a perfect resourcefulness that comprehends all time and space, it is only reasonable to think that the procedure adopted for the guidance of humanity must be the same throughout the world. If the moral and spiritual guidance of humanity was effected in one nation and at one time through any incarnation of God, it must be the same in other nations and at other times. On the other hand, if it had been through prophethood in one nation and at one time, the same should be the case in all other nations and at all other times. It is this fact, more than all others, that made me change my faith from Christianity to Islam, for, if I am to believe in the theory of Incarnation as presented by Christianity (otherwise a sublime religion), I find myself morally obliged to believe in all those God-incarnations which are upheld by different pagan nations. Indeed, the Quran brought a great relief to my spiritual mind by stating that the method of God’s revealing His Will to humanity as experienced and witnessed by the numerous and successive generations of Hebrew Prophets has been the one and only method known to humanity, and that the method of Incarnation was only the figment of the pagan mind, which has no foundation in fact. The Quran clearly lays it down that all the religious heroes worshipped as incarnations of the Divinity were nothing but human beings inspired by the Holy Spirit of God, and were deified only after their death. I quite realize, however, the difficulty of a Christian in appreciating the effectiveness of prophethood in the matter of the spiritual redemption of humanity, for his concep­tion of prophethood is the result of the stories he reads of the Prophets in the Old Testament. If the Prophets were what these stories would have us believe, it is indeed prob­able that, instead of leading us to salvation, they will lead us to perdition, unless some more effective method be adopted for our redemption. The Islamic conception of prophethood, which, in my opinion, is its original conception in the Hebrew Tradition, is very different. The Prophet receiving, as he does, the direct touch of the perfect attributes of God, is, according to Islam, the moving embodiment of all positive virtues, whose very company transforms the most sinful into a virtuous man. In fact, it is absurd to think that the fountainhead of all virtue and purity will speak to a person who is more impure than an average man of the world, such as the Prophets are depicted to be in our Old Testament records, or that he should be leading a whole nation into moral conduct and spiritual elevations. The Quran, therefore, gives me a great reassurance when it condemns as spurious all those Old Testament stories that hold up the Prophets in a bad light. Given the Islamic standard of spirituality in the Prophet, humanity needs only prophets, and nothing more or less than prophets, for its redemption. The theory of Incar­nation would appear not only unnecessary but indeed confusing. If God should take material shape for our redemption, what would happen to His responsibilities as the Controller of the Universe and its Destinies? Chris­tianity tries to solve this difficulty by assuming in the Divinity another person called the Father, but this only confuses the issue of the control. It is only the power at the source that should be called God, and not the agencies that are subordinate to it. If, however, we ascribe Divinity both to the Invisible Spiritual Power that is at the source of creation and to the supposed incarnation whom people find living among them, we create in the universe a diarchy which is incompatible with any peaceful and progressive administration of it. Moreover, the role of God as an incarnation has always been found to be one of helplessness, whereas He is found to be better able to manage the situa­tion in His invisibility. To me, this conception of God-incarnation seems to be the result of spiritual poverty that prevents a perception of spiritual things spiritually.